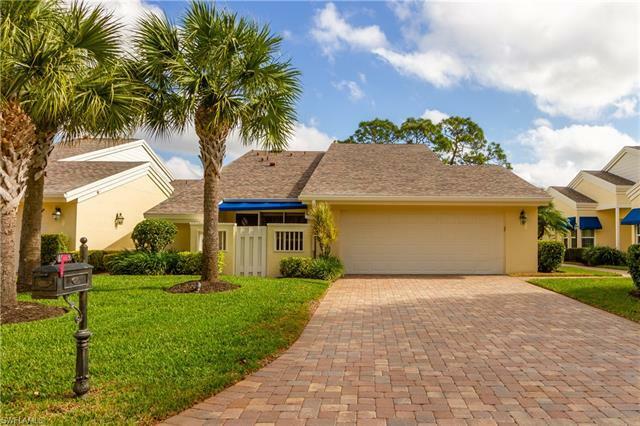 15669 Carriedale Ln, Fort Myers, FL.| MLS# 219015329 | Southwest Florida Residential Real Estate for Sale. Located in magnificent Fiddlesticks Country Club this 3 bed / 2.5 bath / 2 car garage, golf course view home has been beautifully updated. The kitchen features granite countertops, upgraded cabinets, and stainless steel appliances. The bathrooms have new cabinets and granite countertops. Other features include tile on the diagonal in the main living areas, tile inlay in the foyer, carpeted bedrooms, designer baseboards, crown molding in the living room, dining room, and den/third bedroom, and plantation shutters throughout. Conveniently located near dining and shopping, including the brand new Whole Foods, Fiddlesticks offers 2 championship golf courses, clubhouse with casual and formal dining, 8 Har-Tru clay tennis courts, new 7, 000 square foot fitness facility, new resort style zero-entry pool with cabana bar and pool-side dining, and many social events throughout the year. No CDD fee! $50, 000 equity membership due at closing.